for the thumb to thumb. dirty, cloudy, angled, morphed and helpless. 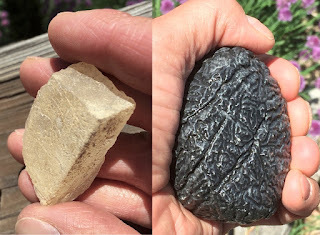 in the palm, a coral brain, formerly sentient rock? sandblasted a million years, can no longer talk. (rock as a memory repository?) Spin, spin, spin ___. from Carolina’s phosphate, dug up by the dozer load. Dangerous sea. Hear the scream. Munch münch. Jesus is the name of the trilobite. against another - from a distance - is magic. and so reveal: The Reasons for the Seasons. goes supernova: the heat of molecular feeling felt. to harness the Energy of Ocean Currents! 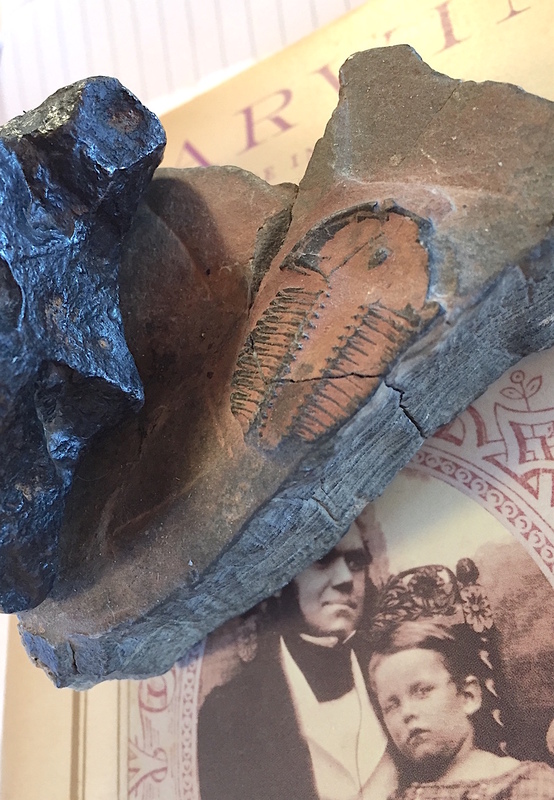 Geologist and poet Danny Rosen lives in the Grand Valley of western Colorado, in a house filled with geological mementos. 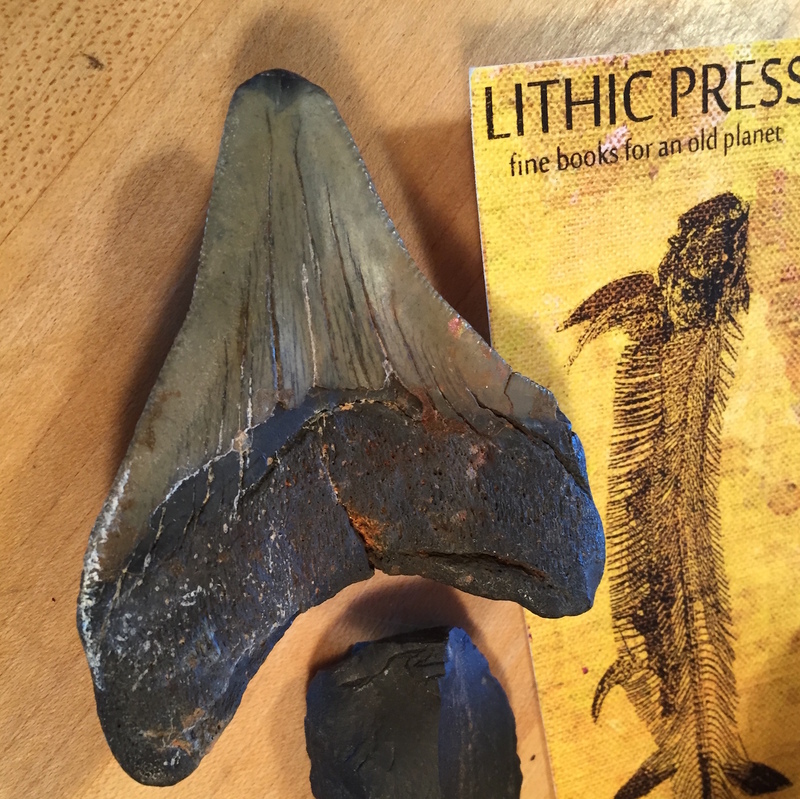 He is founder of the Lithic Press—an independent press publishing, primarily, books of poems—and recently opened the Lithic Bookstore and Gallery in downtown Fruita. 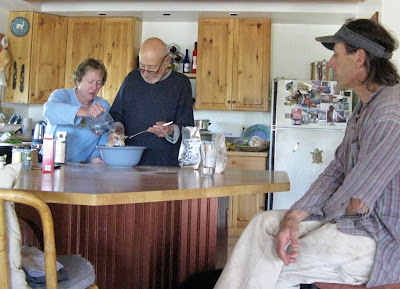 Rosens at the Counter, Danny supervising. 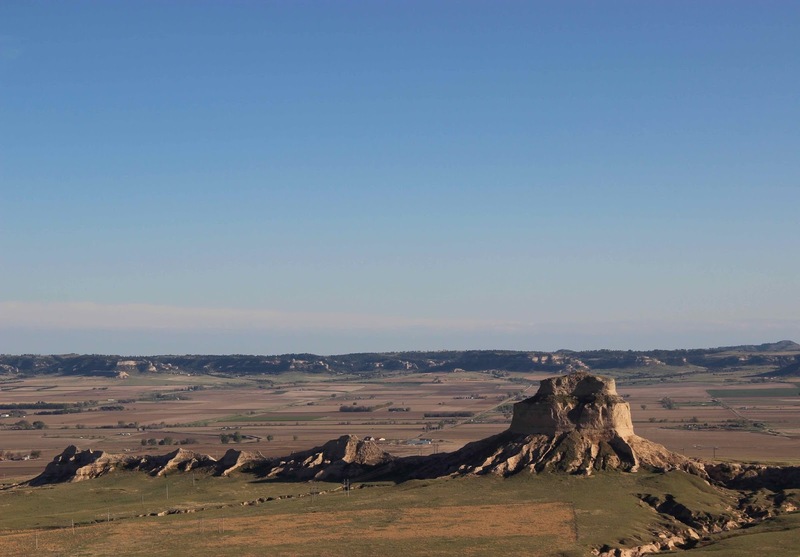 Scotts Bluff mid-distance, viewed from the Wildcat Hills in northwest Nebraska. Between 1914 and 1918, concerned citizens of Nebraska contacted the Department of the Interior in Washington DC four times—twice by inquiry and twice by petition. 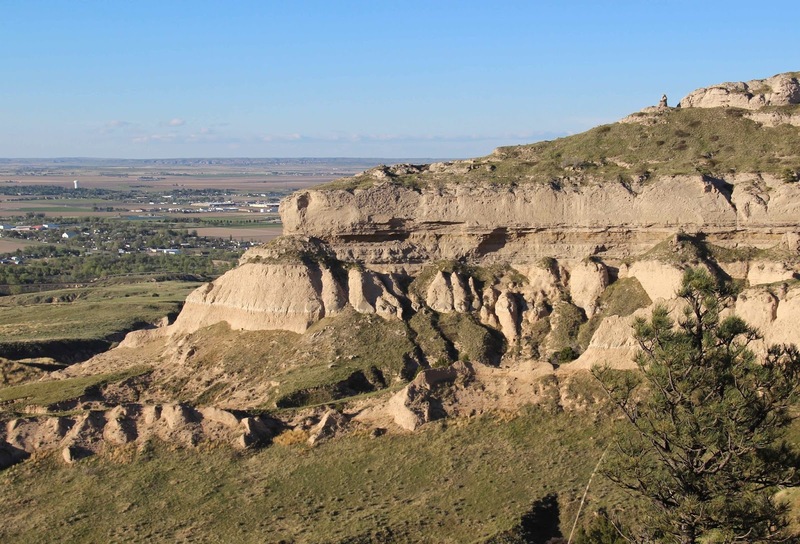 They wanted the president to make Scotts Bluff a National Monument, to honor its importance as a landmark on the Oregon Trail. Their wish was granted by President Woodrow Wilson, who created Scotts Bluff National Monument on December 12, 1919. History buffs weren’t the only beneficiaries. The rocks are full of geological evidence from 25-30 million years ago—when little horses, tiny camels, rhinos, ruminating hogs, and other mammalian beasts roamed the vast savannas, and volcanic ash rained from the sky. And there are treats for plant lovers too. 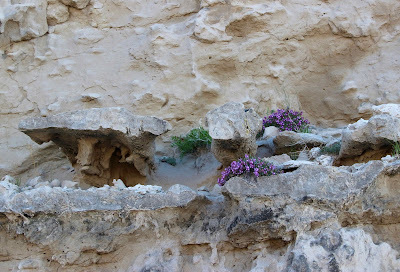 When I visited, I found beautiful rock gardens with colorful spring wildflowers growing in soft pale rock. Evening primrose in an erosional landscape (Oenothera caespitosa). 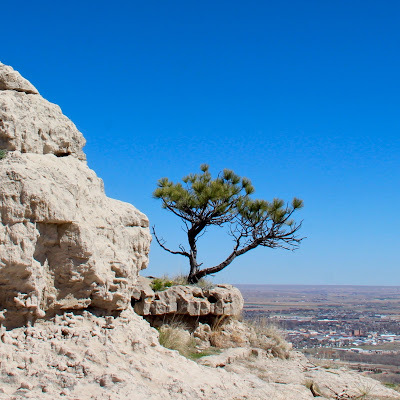 The summit of Scotts Bluff stands 800 feet above the North Platte River—its maker. 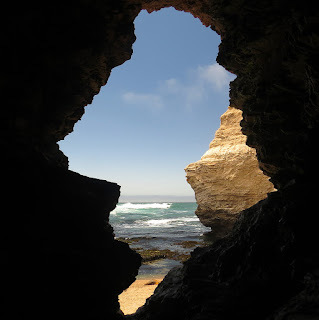 The river has taken advantage of the soft rocks to carve this landmark and others nearby. But there are downsides to the Sculptor’s hand. For example, part of the trail from the Visitor Center to the summit is closed due to rock fall. The most alluring section—where a tunnel goes though Saddle Back Rock—was inaccessible. Bummer! The Master’s work is never done. After hiking the open sections of the trail, I chatted with park staff who recommended walking the park road when it’s closed to traffic—before 8 am or after 5:30 pm (7:30 in summer). This is a greater opportunity than you might think. There's plenty to see, but when driving it’s impossible to look at anything as there’s no place to stop. Sauntering is a much better way to enjoy the scenery, plants and rocks along the road. Rock gardens were common, but unfortunately it was quite windy, and only a few of my plant photos were in focus. The rocks were more cooperative. 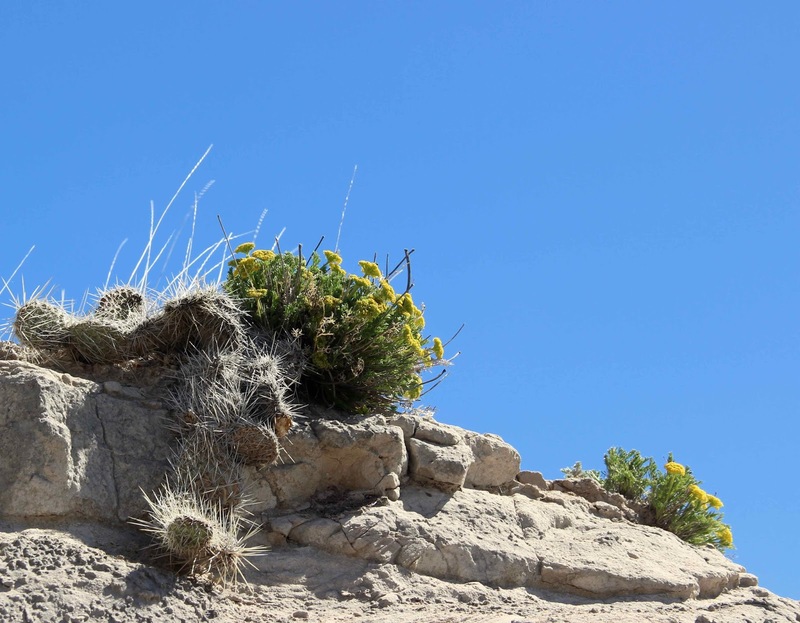 Narrow-leaved musineon (Musineon tenuifolium) with prickly pear cactus (Opuntia sp.). 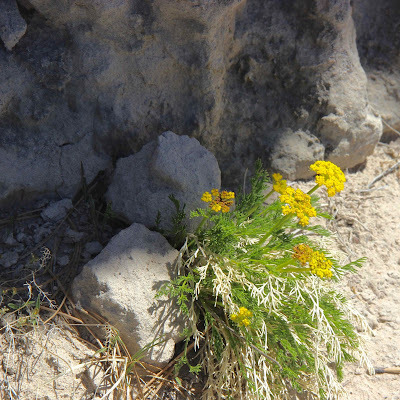 The musineon (also called slender wild parsley) was common in the rocks at the summit. 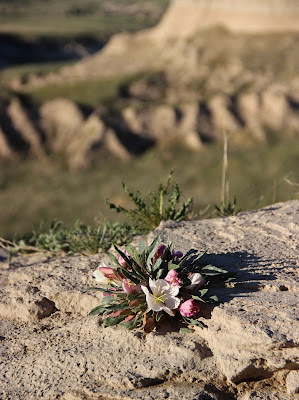 Evening primrose in the evening. The closed pink flowers have already bloomed. Prairie golden peas (Thermopsis rhombifolia) were a bit stunted, but not much considering their habitat. Bonsai ponderosa pine—hardly ponderous (Pinus ponderosa). 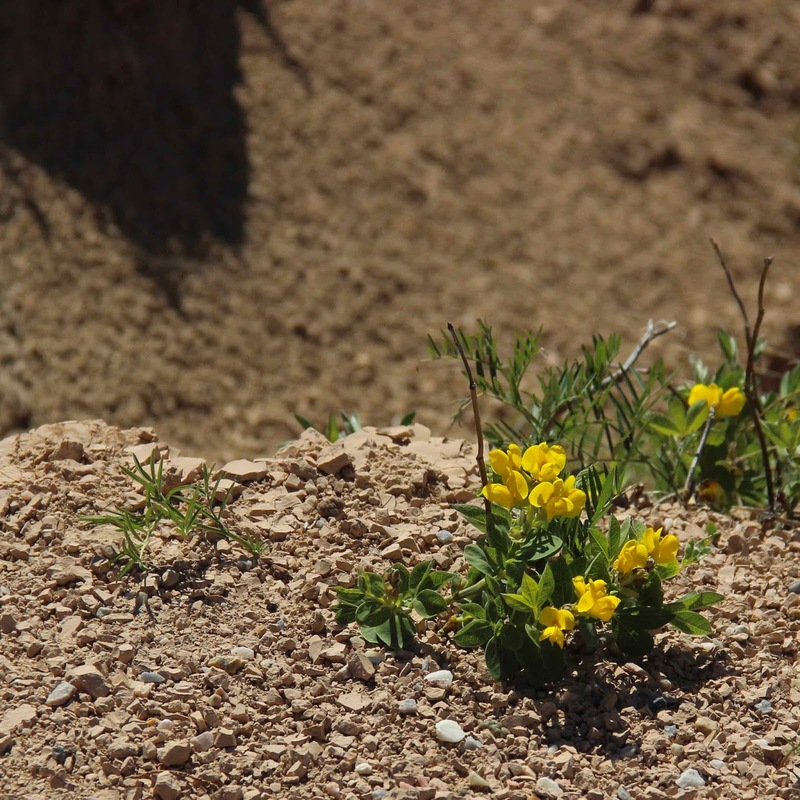 Locoweed (Astragalus sp.) 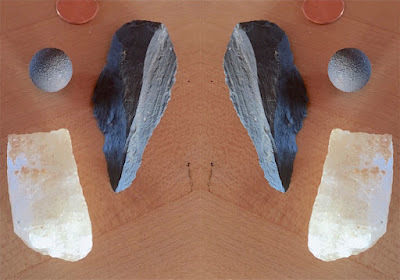 on calcareous concretions! (more on this below) At least thirty species of Astragalus grow in Nebraska. Only a few are true “loco” weeds, i.e. toxic. 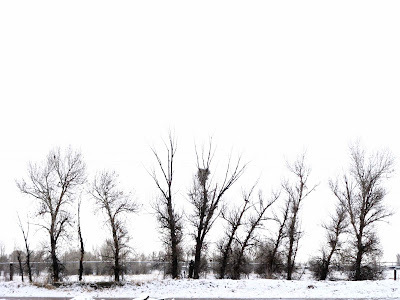 The Sculptor is visible in the distance—the North Platte River. 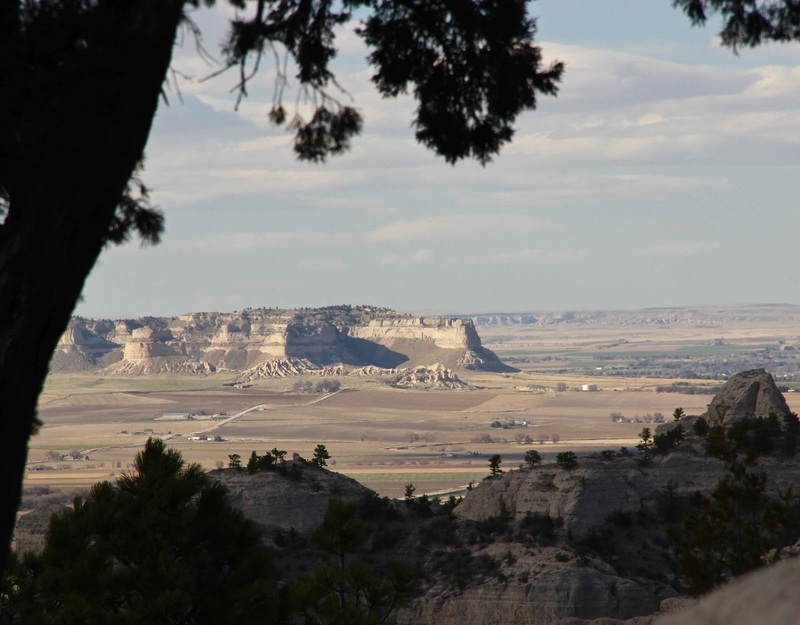 Pine Ridge forms the horizon. Near the summit, road cuts and erosion have exposed hard pipy (pipe-shaped) concretions in rocks of the Monroe Formation. 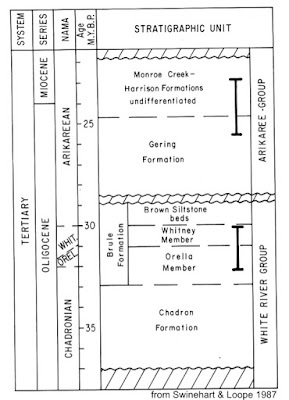 They formed after sediments were deposited, “by precipitation of calcium carbonate from groundwater” (Maher’s Roadside Geology of Nebraska). 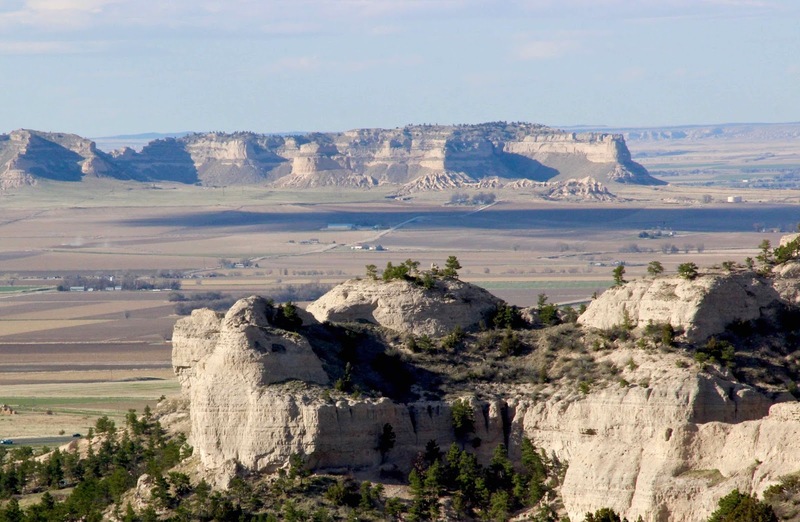 The elongate concretions all are oriented northeast-southwest, both at Scotts Bluff and north of the river at Pine Ridge. Why? … apparently it's still a mystery. 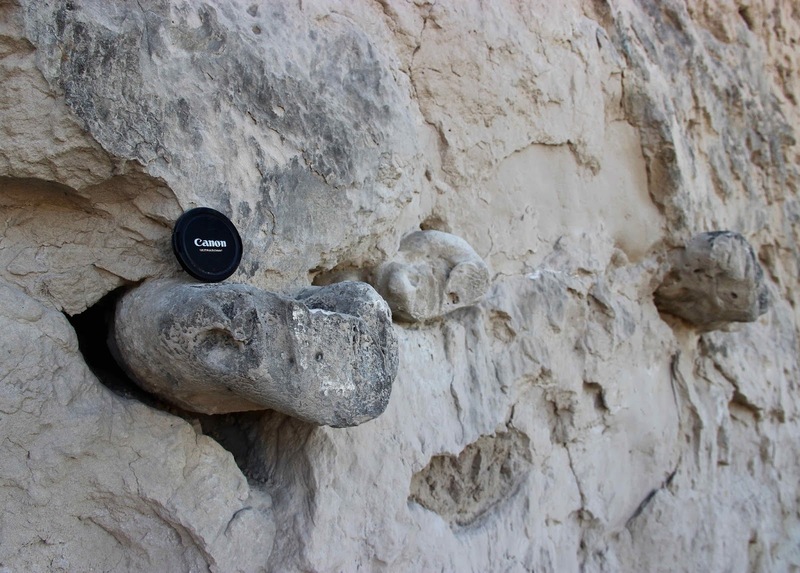 Concretions stick out because they're harder than the surrounding rock and resist erosion. Pipy concretions all in a row. 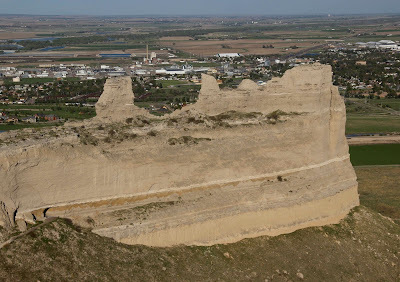 It was Will Maupin who first suggested a paved road to the summit of Scotts Bluff. This was sometime between 1920 and 1924, when he was serving as the first Monument Custodian at a salary of $1 per month (he also was editor of the local newspaper). Road construction began in 1932, and continued off and on until September 19, 1937, when the paved road was opened to the public (source). 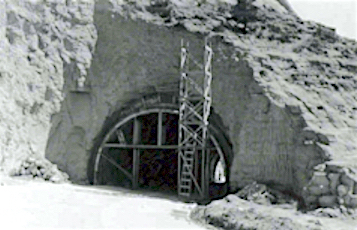 Boring the lower tunnel in the 1930s (NPS; no source given). Lower tunnel today, from middle tunnel. 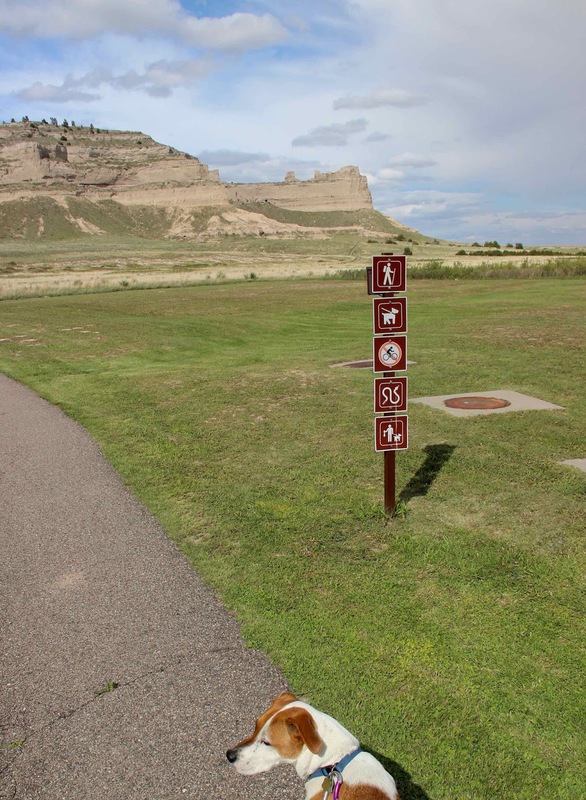 The closed road is popular with runners and walkers, both human and canine. Distance is three miles round trip. The steepest slopes have been plastered over, but rocks still fall. "Plastered" slope (my term), with drain pipes at base. Looks like Park staff have to clear rocks from the road on a regular basis. 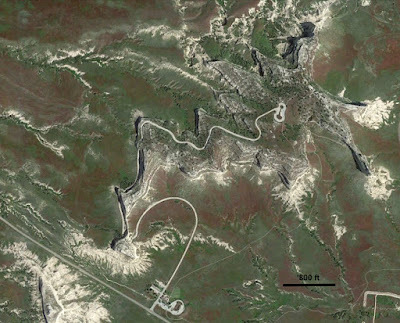 Scotts Bluff from the air, courtesy Google Earth. Click on image to view road and trails. 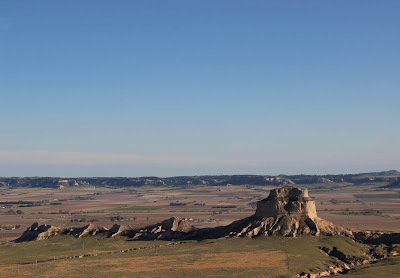 Scotts Bluff in northwest Nebraska, viewed from the Wildcat Hills where I recently camped. It hadn’t been dark long when a loud wailing awoke me. I jumped from the tent before realizing it was just the wind in the ponderosa pines, the noisiest of our pines. Something about the long needles … I was trying to remember … but then it suddenly stopped. Dead silence. How eerily odd. Was it really the wind? As the sun rose, the voice faded into silence. 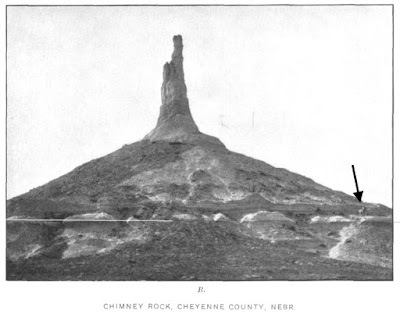 Chimney Rock; horse stands on a bed of volcanic ash (Darton 1903; arrow added). 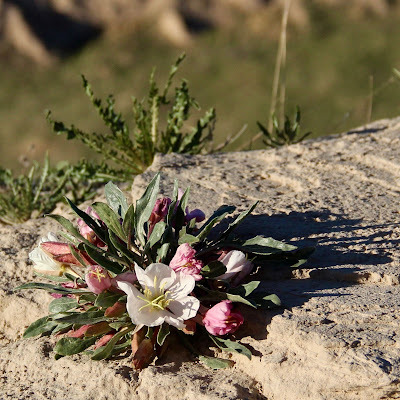 At Scotts Bluff National Monument I was greeted by good news and bad. The trail to the crest passes very close to the mysterious contact, and dogs can go too! But the trail was closed until further notice, due to a large rock slide. Saddle Rock Trail, lower trailhead; destination is was the more distant rock ridge. 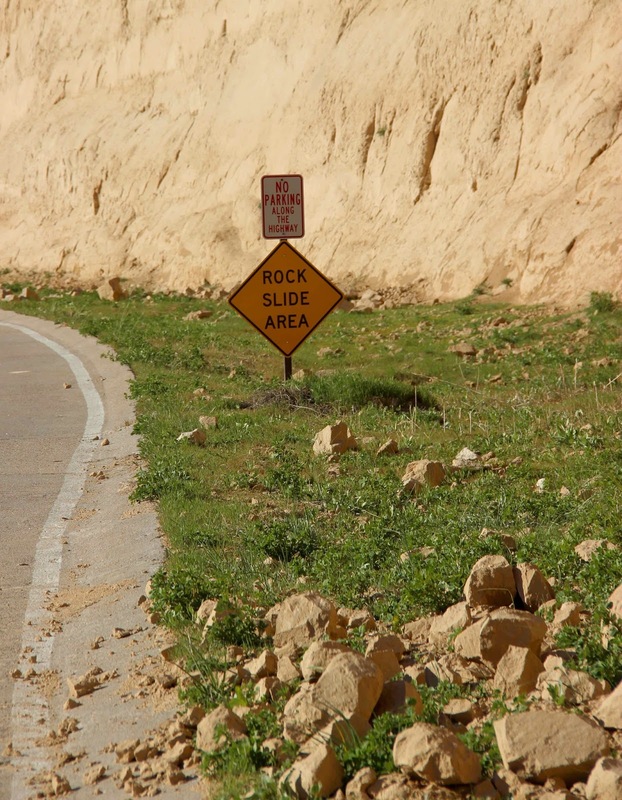 Rock slide across trail. 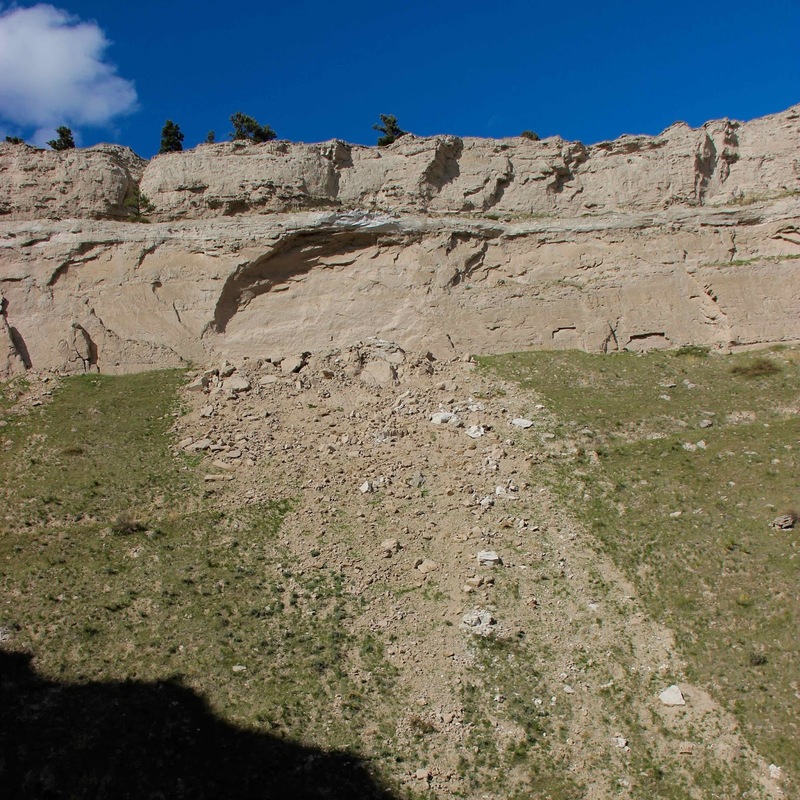 Managers are debating whether to repair the trail or close it permanently (NO!). We hiked three-quarters of the way up, to the lower barricade, and then drove to the top and hiked down to the upper barricade. In neither case could we examine the mysterious contact carefully. But we were close enough for photos, in fact tantalizingly close … if only … should I? … sigh, no … I’d be in plain view and besides, the staff had been so friendly and helpful. Trail goes through a tunnel in this rock ridge ... you can see why I was lusting after this hike! 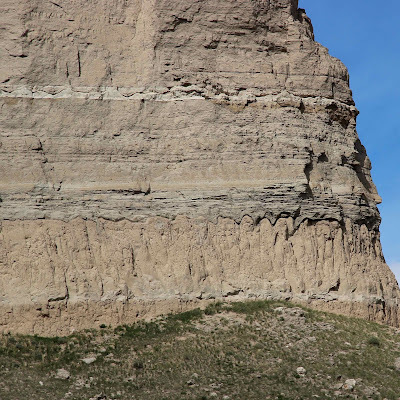 As the ghostly lecturer had explained, Scotts Bluff is an erosional remnant that was left standing as the North Platte River eroded and carried away surrounding rocks. It's one of several of local remnants curious enough to be named: Dome Rock, Sentinel Rock, Crown Rock, Chimney Rock and more. Dome Rock, viewed from the top of Scotts Bluff. 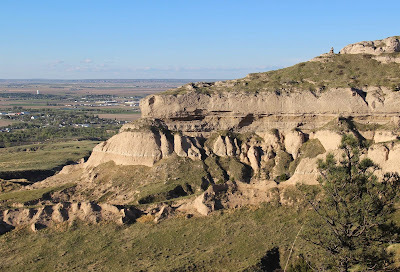 Saddle Rock at east end of Scotts Bluff; view from South Overlook. 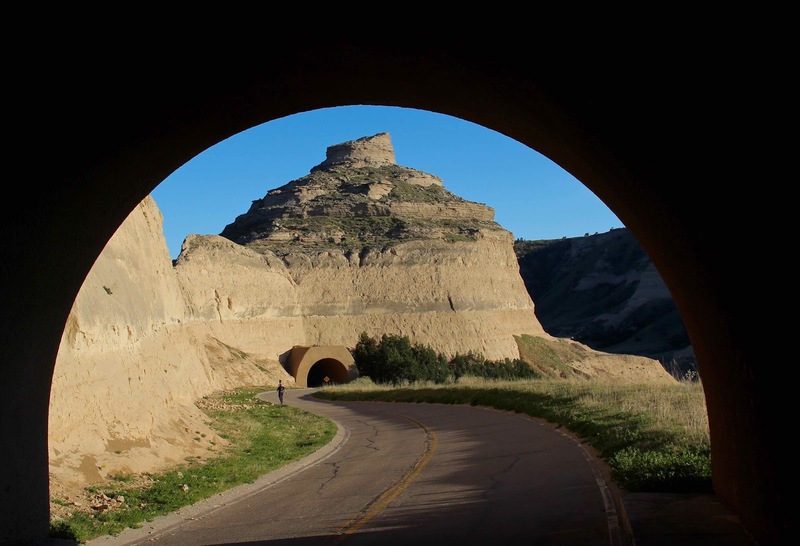 For travelers on the Oregon Trail—who had endured day after day after day of heat, dust and monotony crossing the Great Plains—these distinctive buttes, bluffs and monuments were a welcome relief. People often paused for a moment before trudging on westward—“in wonder to see such a natural marvel and many remembered it long after their journeys were over” (source). 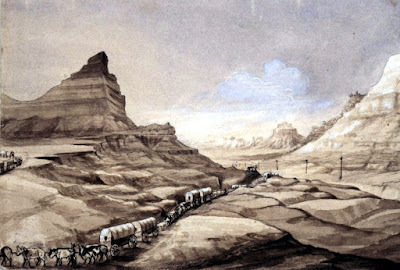 “Mitchell Pass” (now part of Scotts Bluff NM) by William Henry Jackson, 1866. 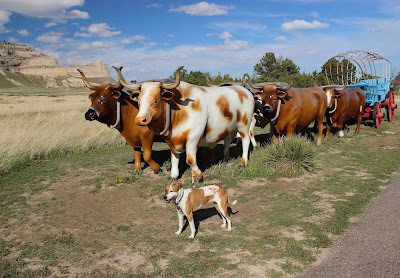 He was working as a bullwhacker on a wagon train. From Scotts Bluff NM, used with permission. More than 250,000 hopeful emigrants passed Scotts Bluff between 1843 and 1869! 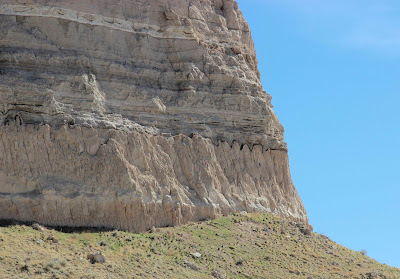 Rocks in the Scotts Bluff area started as sediments eroded off the Rocky Mountains roughly 35 to 20 million years ago. They were carried down by streams and deposited in a great wedge to the east. 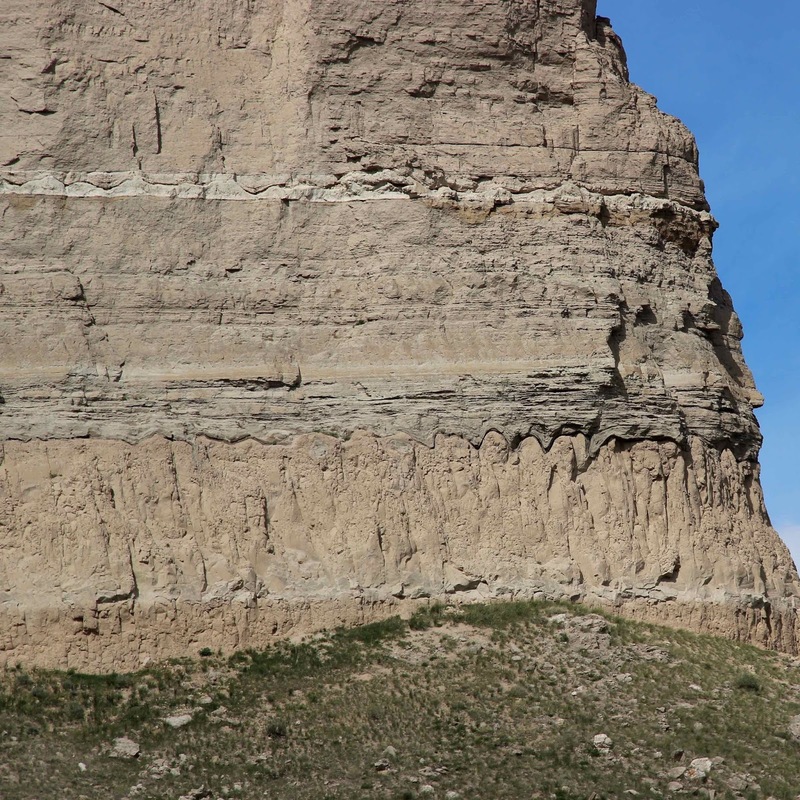 In all, there were three major pulses of deposition; rocks from the first and second are exposed at Scotts Bluff. 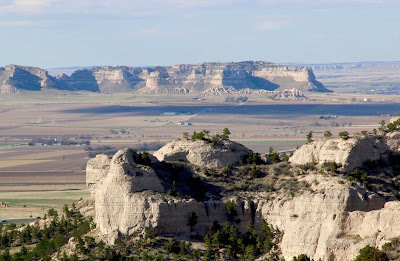 These are the Brule and Gering Formations (geologists assign such names to distinctive rock units). 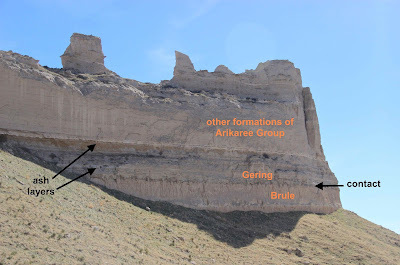 Oldest to youngest rocks from bottom to top (as we would expect): Brule Formation of the White River Group, and Gering Formation and others of the Arikaree Group. 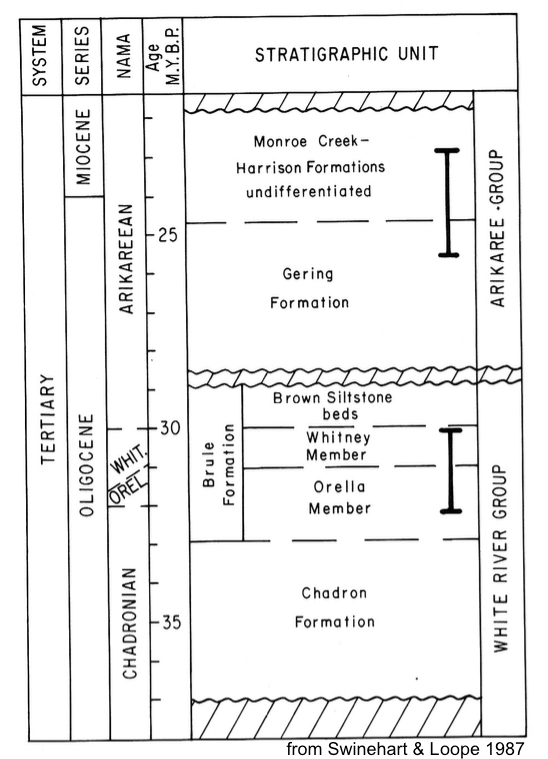 Time stratigraphic chart; vertical bracket bars show rocks exposed at Scotts Bluff NM; source. At Scotts Bluff, the Brule Formation is mainly volcaniclastic siltstone, but includes a layer of regular sandstone and siltstone. 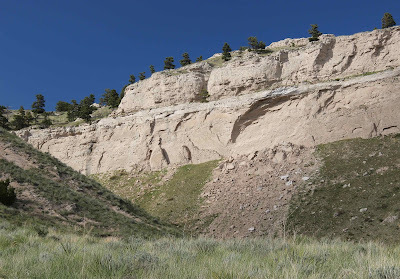 The Gering is volcaniclastic sandstone. The white layers in both are volcanic ash beds. The darker brown zone is referred to as “oxidized” but I could find no explanation as to how this came to be. Between the Brule and Gering is where things get interesting—in fact, mysterious. 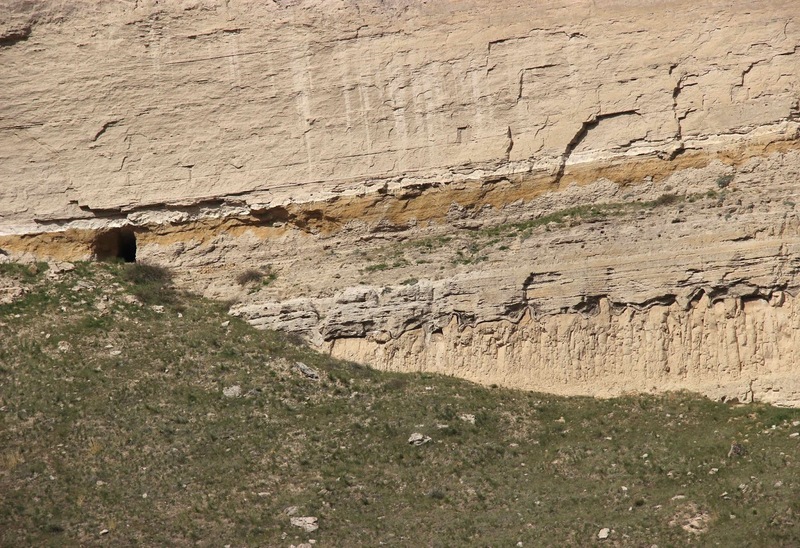 There is an unconformity here—a gap in the rock record of perhaps four million years (source). 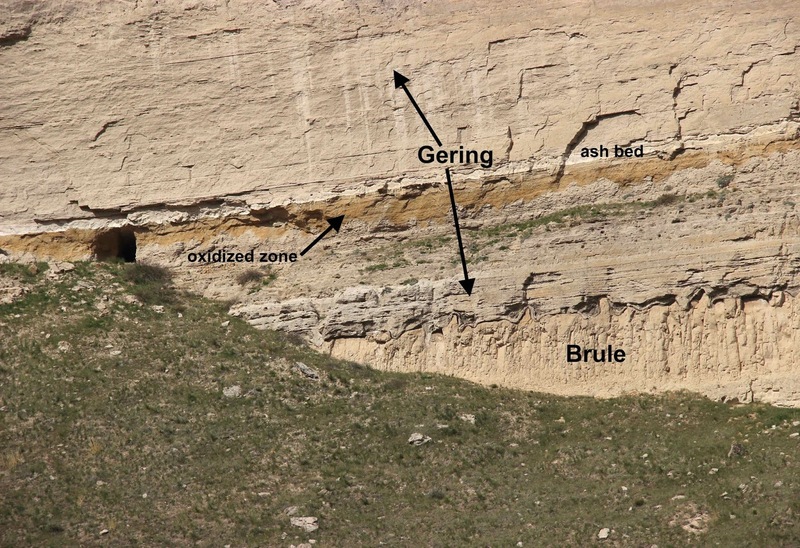 The Brule episode of deposition ceased, and four million years of erosion (or at least non-deposition) passed before the next pulse of sediments came down from the Rockies. We love unconformities—they’re often easy to see and it’s so cool to be able to read the past from the rocks! And there’s something especially intriguing about this one. 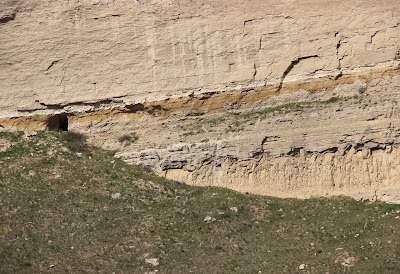 Southeast and downhill from the tunnel, the Brule–Gering unconformity or contact is nicely exposed. Elsewhere in the park it's flat with little relief, but here it’s wavy! Brule–Gering contact does The Wave. 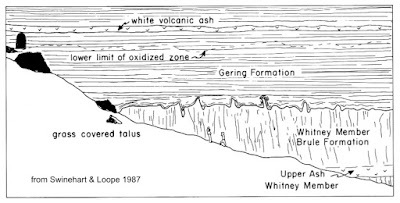 Brule–Gering contact below tunnel (upper left). 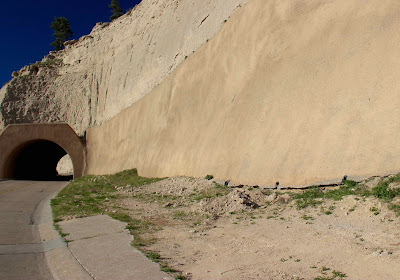 Note people on slope (six feet tall); source. Zooming in on the undulations from the trail across the draw. 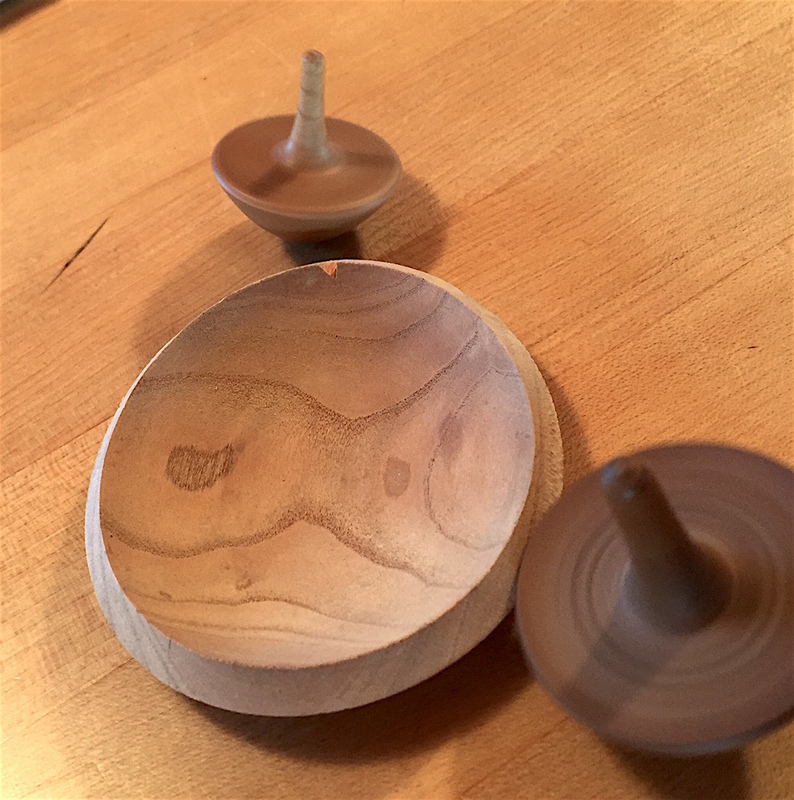 How did this wavy surface come to be? 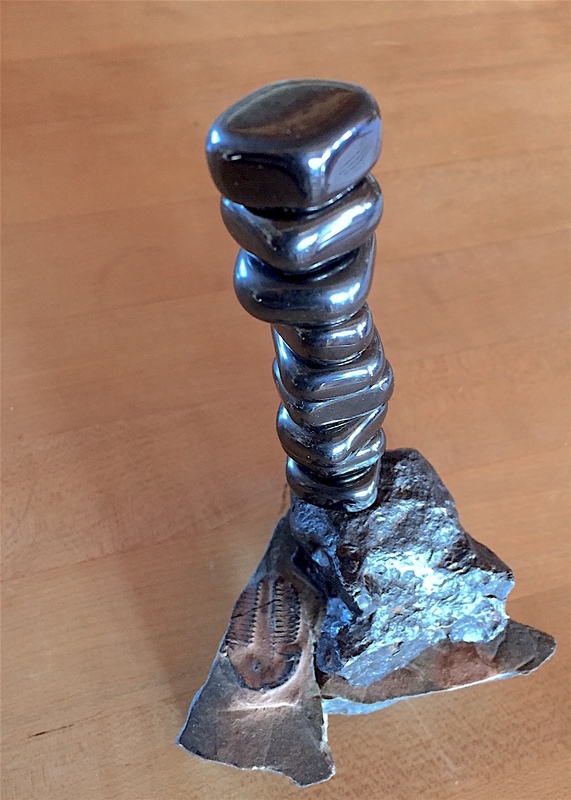 In what kind of environment do we find such forms? 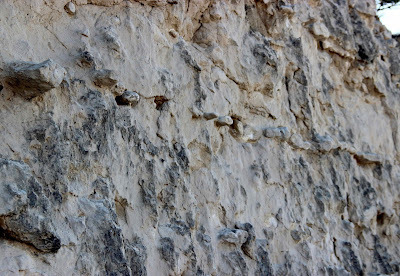 Are they erosional features of some kind? Answer: Apparently no one knows. 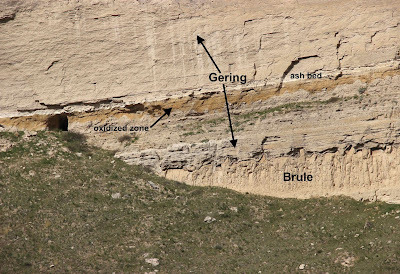 In Roadside Geology of Nebraska, Maher and colleagues offer two alternatives. Maybe the undulations are old erosional features on the Brule surface that were buried by younger Gering sediments. 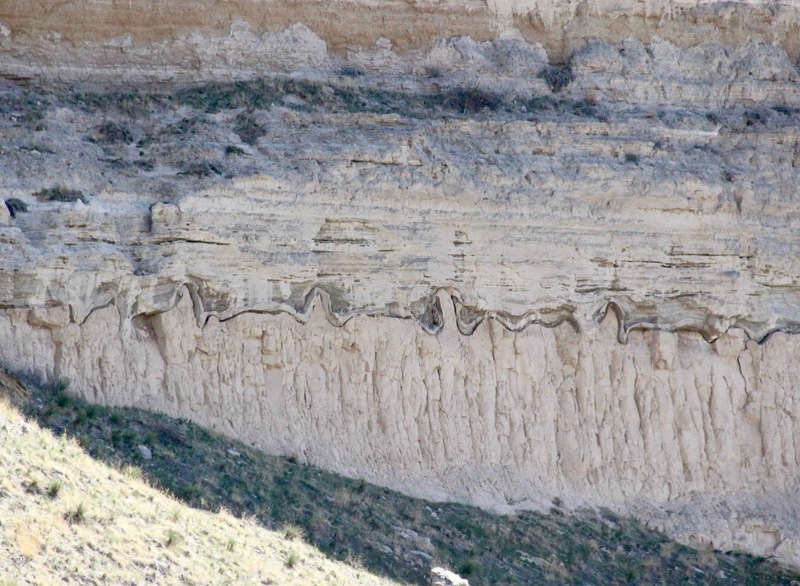 Or maybe Brule sediments moved under the weight of Gering sediments (soft sediment deformation). 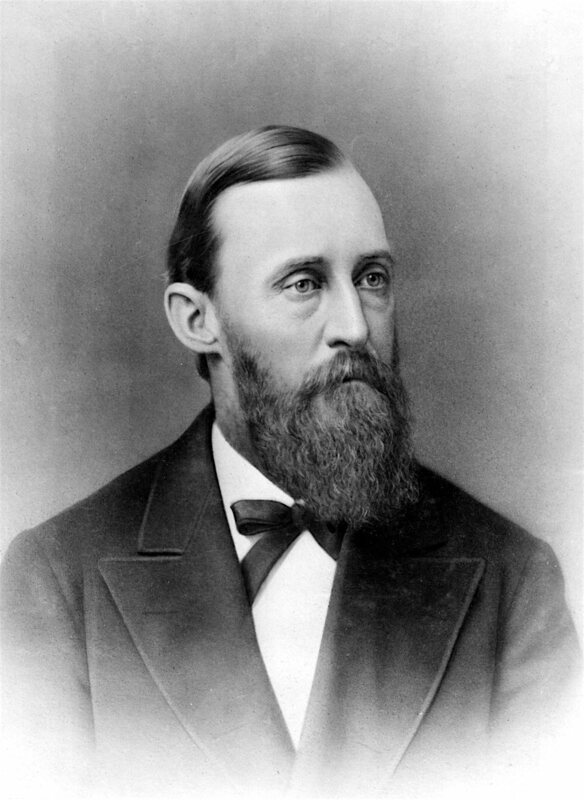 Ferdinand Vandeveer Hayden, head of the US Geological and Geographical Survey of the Territories (1867-1883); source. Hayden, FV. 1871. Preliminary report on the geological survey of Wyoming, and portions of contiguous territories. Washington, Government Printing Office. 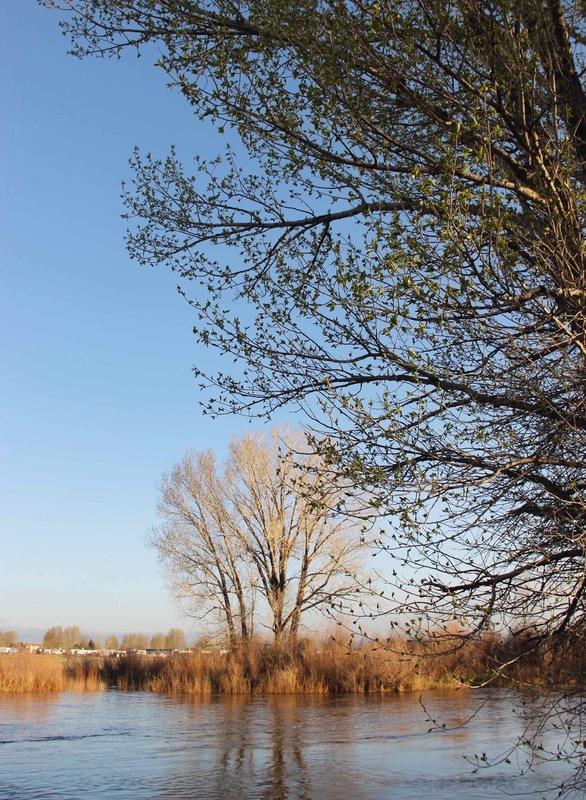 Cottonwoods in spring; Laramie, Wyoming. The middle tree has a magpie nest. 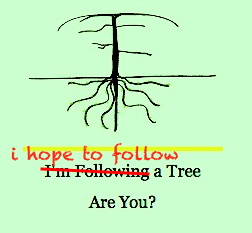 I’m a tree-following slacker, with no monthly report. It’s still snowing—good for plants but not for unpaved roads and trails, and being human, I’m busy with other things that supposedly have to be done. 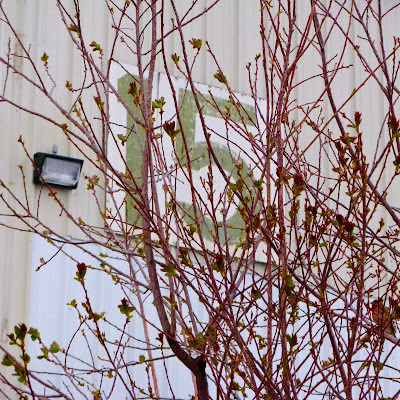 My serviceberry/juneberry (Amelanchier) may well be blooming, and I may well miss it. However, I do have tree photography news to report. 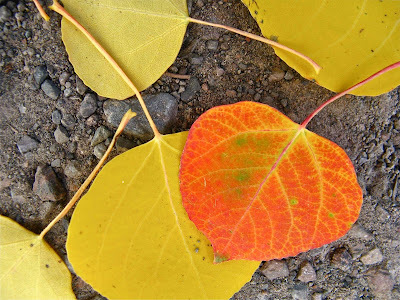 First, Anne McKinnell recently posted How to Photograph Trees—interesting and helpful as usual. I recommend her eBooks, with clear instructions and assignments (challenging but always fun). 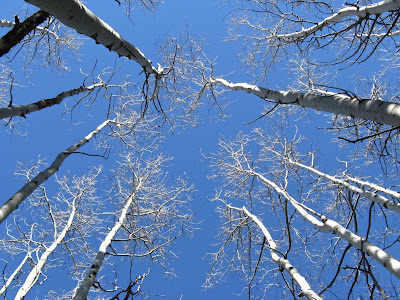 Second, a photographer/tree-lover friend now has an Instagram site and is happy to share. Anne points out that trees often are difficult subjects, mainly because they’re so big. They feel majestic—but how can we capture that feeling in a photo? Sometimes it’s effective to shoot from our limited perspective as mere humans, anchored to the ground. Giant sequoia; Sierra Nevada, California. (RC Koeppel). 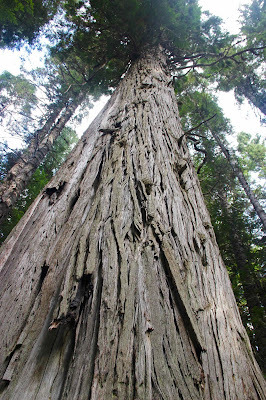 We see only the trunk, but the striking contrast with other trees makes its majesty obvious. Red cedar; Ross Creek Giant Cedar Grove, Montana. 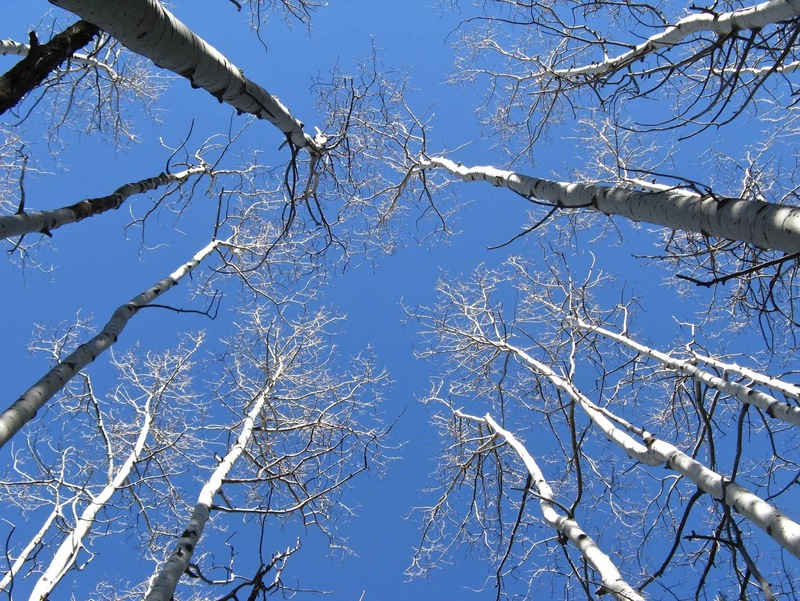 Quaking aspen; Laramie Mountains, Wyoming. But what if we come across a tree that can’t be captured in its entirety. Maybe we should choose a photogenic part of it instead. 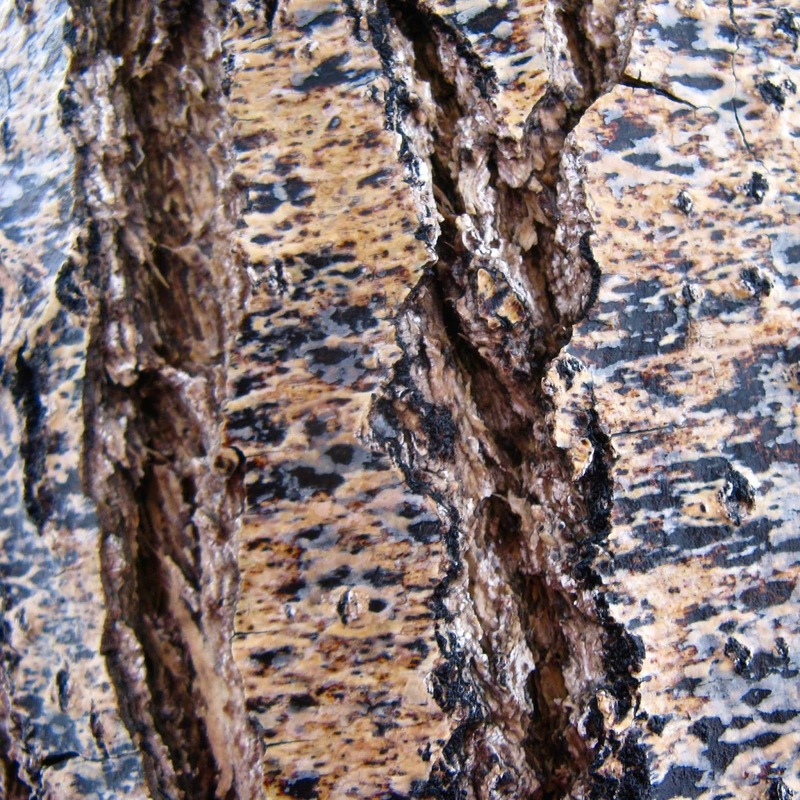 Bark is often an obvious choice—because of texture and pattern. I like bark photos because they can be abstract—they draw me into a world different from that of the whole tree. 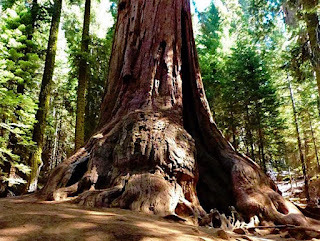 Giant sequoia, “singed a bit but still alive;” Sierra Nevada, California (RC Koeppel). Palm tree; Morro Bay, California (RC Koeppel). 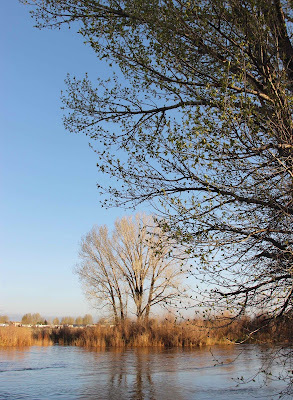 The cottonwood I followed in 2014; Laramie River, Wyoming. Is it possible to make a photo of a forest interesting? They can be pretty repetitive. But repetition is an effective compositional tool. Eucalyptus trees; Los Osos, California (RC Koeppel). The tip I found most helpful was “strong graphic design”—mentioned multiple times. Anne didn't define it explicitly, but somehow I knew what it meant. Basically you don’t want a chaotic collection of branches or leaves or whatever. There needs to be a clear subject. 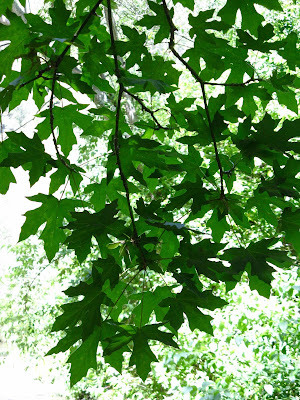 High forest oak; Central California Coast (RC Koeppel). Dead and burned (eucalyptus); Central California Coast (RC Koeppel). Finally, photograph trees for the season! Quaking aspen; Fish Lake, Utah. Autumn means color, right? Not necessarily. Anne emphasizes early on that one of the first steps in composition is to consider “how do you want the photo to look – bright and cheerful? Gloomy and mysterious? 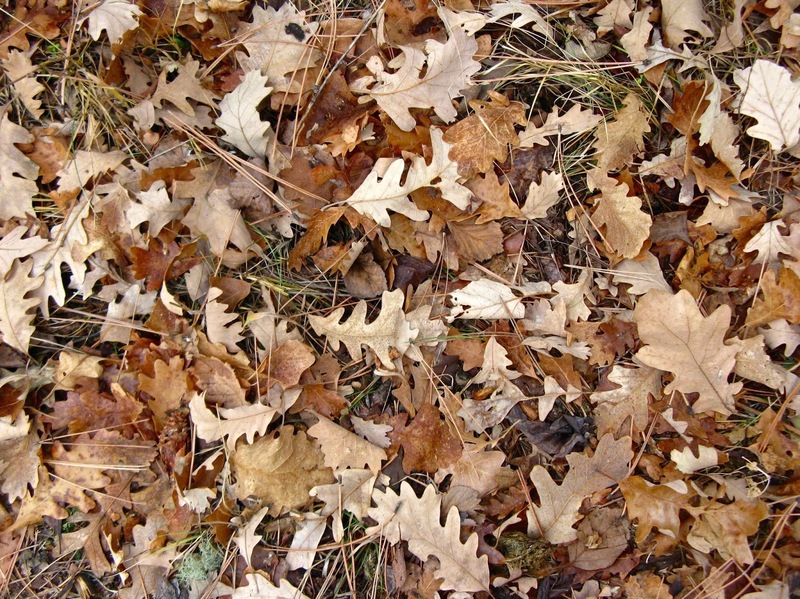 …” For me, fall feels like death, the end (fortunately only until spring). Bur oak; Dugout Gulch, Wyoming. 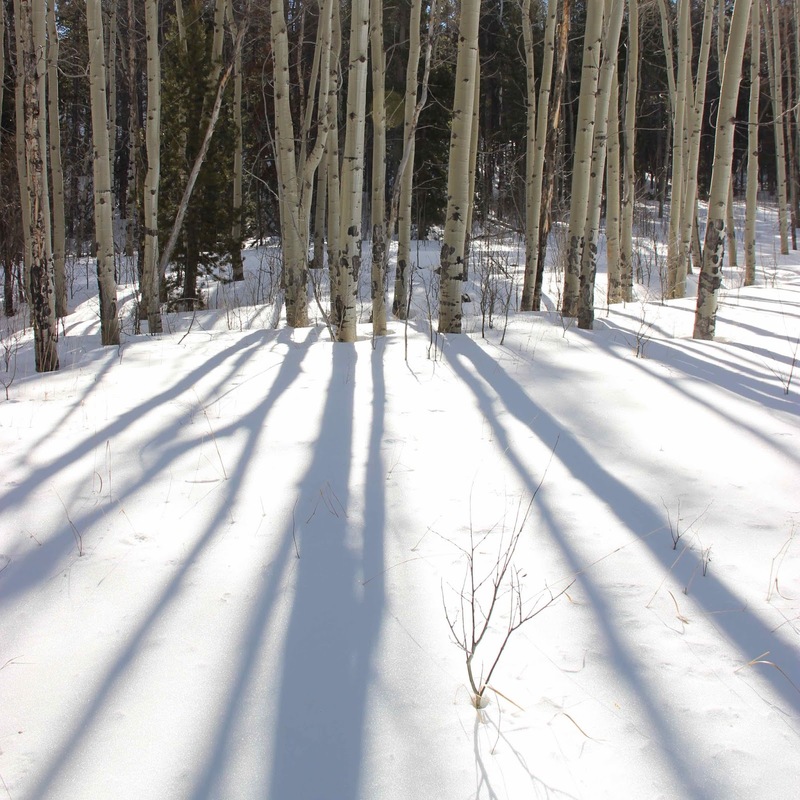 Winter trees often present the same challenges as dead trees. So think repetition and strong graphic design. 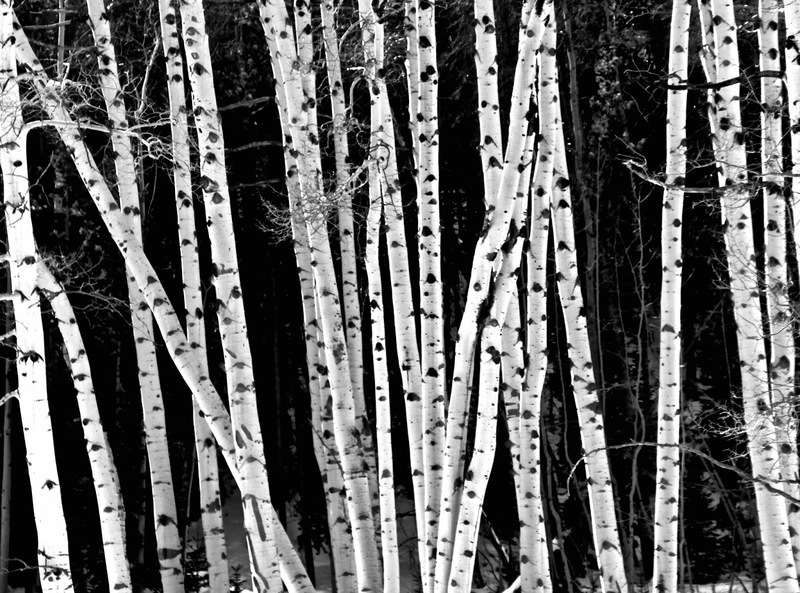 Try black-and-white photography—to emphasize form, shape, and pattern. 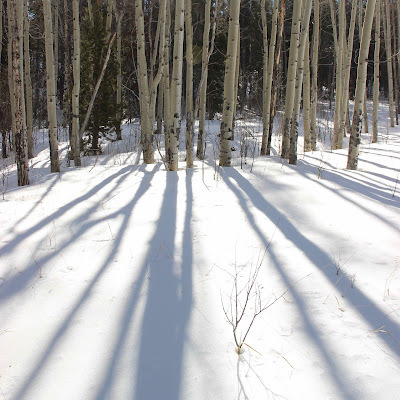 Quaking aspen and their shadows; Enchanted Forest, Laramie Mountains, Wyoming. 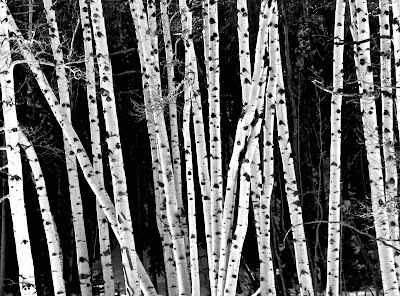 More aspen from the Enchanted Forest. Spring is all about renewal—buds, fresh leaves, flowers. Anne recommends close-ups, maybe with a macro lens, to capture the details of young growth. But not if you live in Laramie. 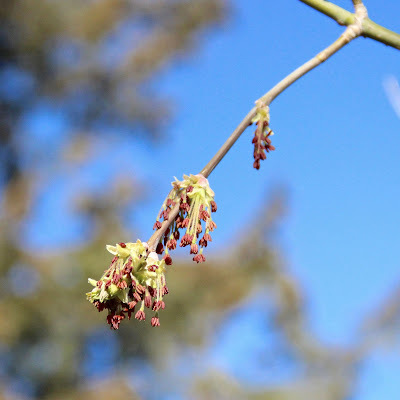 Here spring means wind, the nemesis of plant photographers. 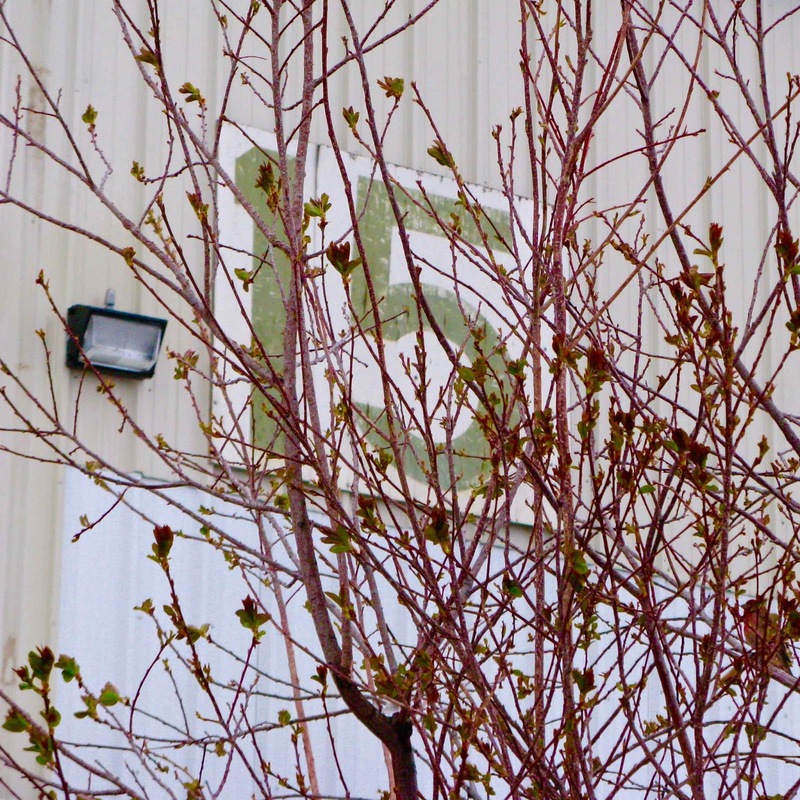 Fresh spring leaves in wind; Laramie, Wyoming. Note spring fauna lower right (American robin). Male boxelder in bloom, near the highest waterfall in Nebraska. It was windy here too! But I tried a fast shutter speed, shot lots of photos, and some turned out to be in focus, amazing. Summer is surprisingly tough for tree photography, unless you live someplace arid. 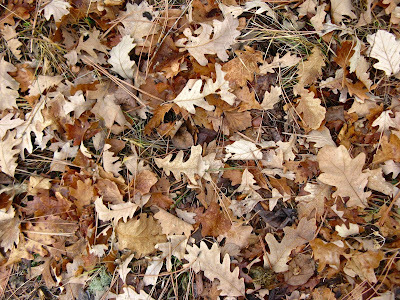 See Anne’s post for ways to deal with endless cover of lush green leaves hiding much of interest. Challenging, yes—but for some reason, I look forward to it! Bigtooth maple; Lopez Canyon, California. Other tree-followers have shared their news at the virtual gathering hosted by The Squirrelbasket. Check it out!